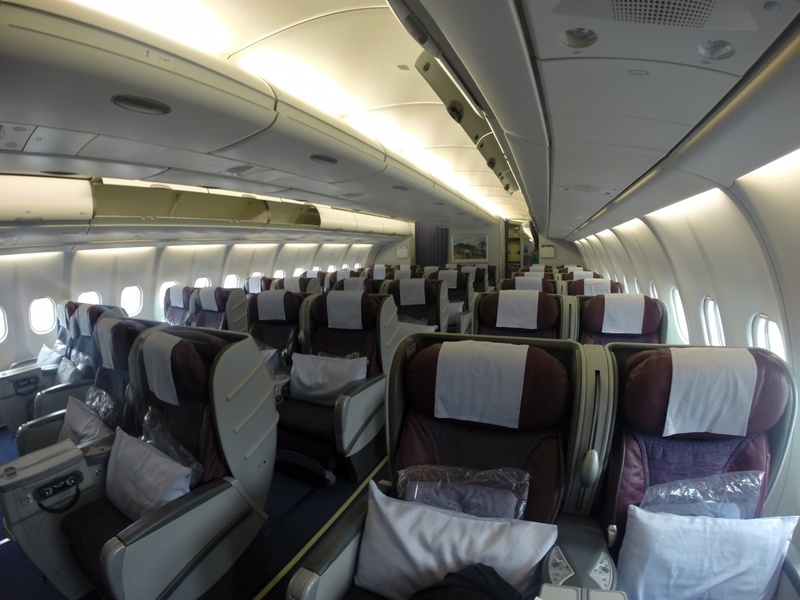 Flying Business With China Airlines: is it worth it? I found myself booking a business class ticket to Bali after a few days of deliberation. While I normally travel economy, there are times when you just really don’t want to be sitting in one of those cramped seats for a 25-hour journey. So I took the plunge and paid the price of $2,700 one way from Los Angeles to Denpasar, with a layover in Taiwan. This price is actually not all that bad considering one way to London from LAX is $3,00 (check!) and this is a far longer journey. I decided to do a review on it, because like most people, I find it interesting to know when and what airlines it’s worth to spend the extra bit of cash on. Flying business domestically I never think is worth it. The flight is never really long enough to warrant the extra prices and the service is not really that stellar. 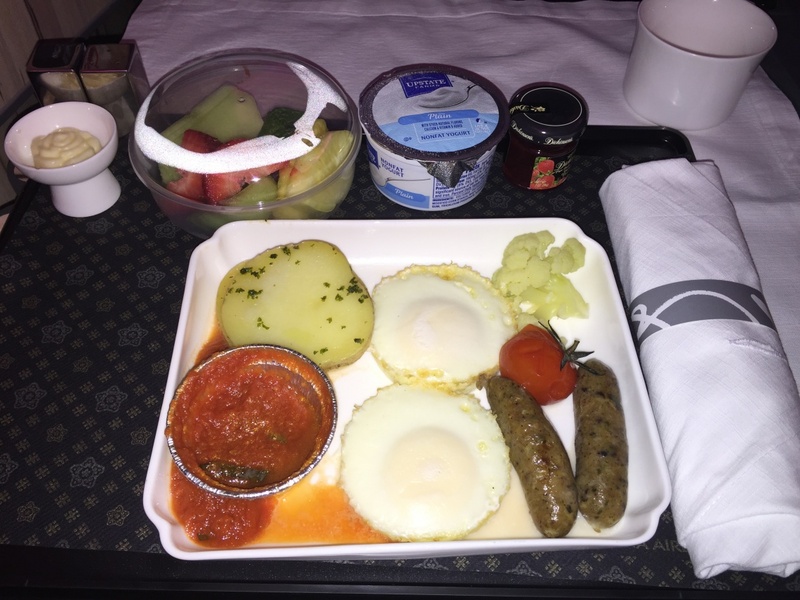 I have found long haul flights to be worth the extra cost though, as you get roomier seats, better care from the flight attendants and much better food. The lounge at LAX: I arrived two hours prior to my 11.25pm flight, ready to check out the Korean Air lounge. Sadly, I can’t say it was really anything special and definitely not worth the higher price to be there. The food was minimal, no bottles of water, and the only thing that was good was having wifi, to which I made a few skype calls to people abroad, did last minute emails and then headed out to my flight. I believe the reason the lounge wasn’t so good is first it was for Korea Airlines and second, because this was not China Airlines’ hub lounge, which means that it won’t has as many amenities as where there base is. The flight to Taiwan: Stepping on the airplane was good. Business class always means you board first, and when it’s a fully booked flight like mine, this was a great thing, as you get to get comfy, relaxed and offered a drink during the 30-45 minutes of boarding. 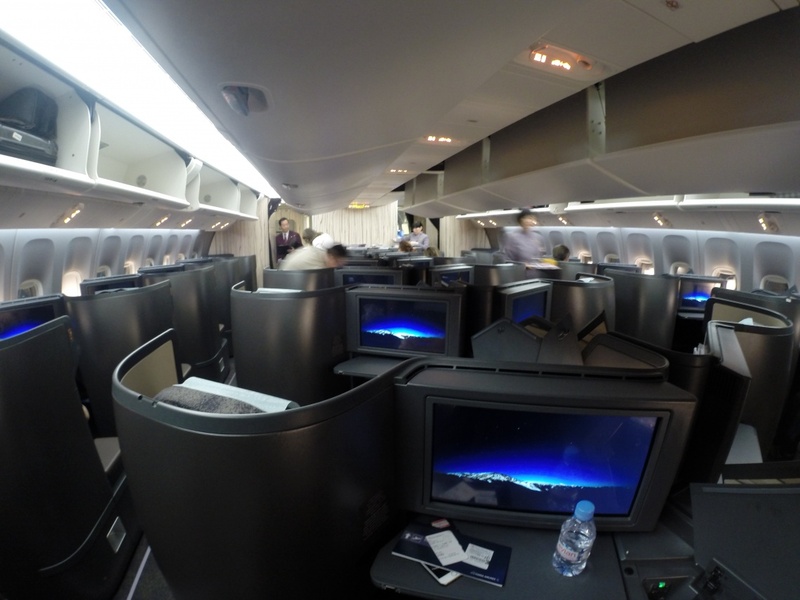 I flew the new 777-300, which has a new business class; with fully extendable seats that recline into a bed, good food and drink options, and a quite large touch screen tv. My drink of choice when I boarded was asking for a huge bottle of water (1.5L) and was the only person to drink this much water on the flight. The flight attendant showed me the drink and meal menus and asked what I would like; I chose a glass of merlot and decided to skip the meal as I didn’t want to eat dinner at 12.30am and go to sleep an hour later. He seemed a bit shocked and kept asking was I sure I didn’t want anything. The inflight entertainment doesn’t come on until you are have taken off, so I read for a while with my personal light over my shoulder. Finally once we had reached our flying altitude my glass of wine was delivered which was delicious and started to watch The Theory of Everything. After the movie I started another one, only to keep myself awake to get on a new time zone and prevent jet lag. The chair reclined to whatever level you wanted and with my pillow and blanket it was perfect. Spacious, comfortable, new(ish) and a pretty big screen. After four hours, I reclined my chair fully, put my sleep mask on and fell asleep for five hours. One thing about this airline is they do give you a little bag with goodies, but nothing out of the ordinary. There was a toothbrush and toothpaste, lotion, face lotion (which seemed like they were both the same), chapstick and a face mask. We were also given slippers, which was nice. Five hours later, I awoke and it was nearly time for breakfast. I chose the ‘American’ breakfast, at the recommendation of the Taiwanese flight attendant (a few times he said this was the better choice and the whole crew liked it more). One great thing about flying business is that you have a very nice tray that comes into your lap, no one pushing their seat into your face as you eat, silverware and real plates. I ended up eating only the fruit as I was not that hungry at this point. I also knew that I would be heading into the Taiwan airport where I hoped there would be some delicious freshly made food. The movie selection was great, with an abundance of movies to choose from, although the majority was foreign. I ended up watching The Theory of Everything, Interstellar and a portion of The Imitation Game. Not bad! By the time we were landing, I felt as if no time had passed, let alone being on a plane for 14 hours! There was hardly any turbulence and we had a great landing, arriving at 6am two days later in Taipei. Taiwan Airport & Lounge: I meandered my way through the airport, which doesn’t have that many shops other than duty free (at least in the terminal I was in) and headed for the China Air lounge. Walking into this was like being in a first class lounge anywhere else. The décor was very calming as it’s dark, clean and very spacious. I headed straight for the food buffet and wow! So much delicious food! I ended up trying quite a few different things, my body not realizing if it was 6am or local time 4pm in Los Angeles. 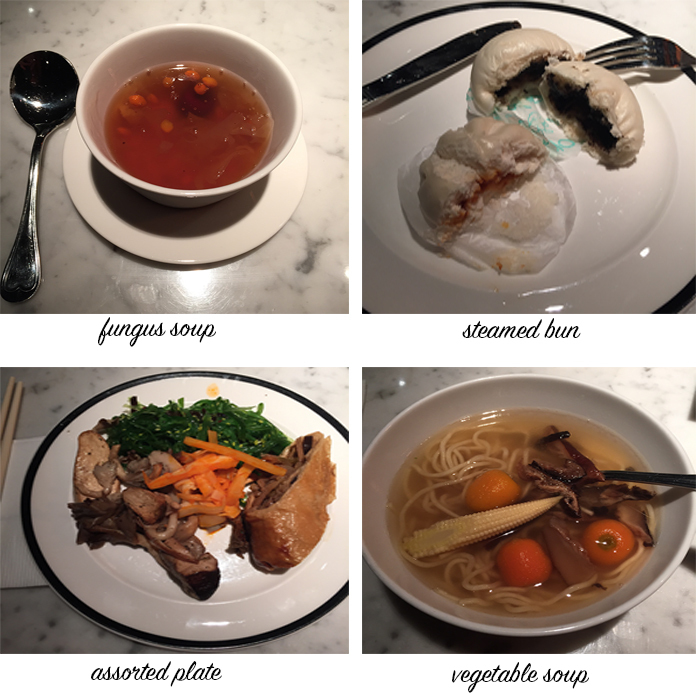 I started with the ‘sweet white fungus soup with veg’ which was interesting. It really had no flavor, was quite thick and had a slightly sweet taste. Not really my thing so I didn’t finish it. Next was the ‘steamed bun with veg’ and the ‘steamed bun with bbq pork,’ both of which I used to love while living in China. Sadly, these were not very tasty and were mainly the bun with little filling. The vegetarian filling had a similar flavor to the red bean buns I became obsessed with in Shanghai…although not quite as good. After that was a plate with ‘shredded bamboo with chili oil,’ ‘stir fried assorted mushrooms with seasoning,’ ‘seaweed salad,’ and ‘vegetarian.’ (No joke on this last one.) I couldn’t quite figure out what it was, but it seemed like cooked egg with some bamboo and mushrooms in it. It had a chewy texture, not much flavor, but was strangely addicting. The bamboo was spicy and crazy salty, while the mushrooms and seaweed salad were delicious. The last thing I tried the ‘vegetable soup’ and this was very good. Not too salty, very refreshing and tasty and after adding some chili oil it was perfect. They also had a buffet of bacon, sausages, fries, and lettuce- the ‘western’ breakfast, which a few people were eating. It looked totally unedible to myself. 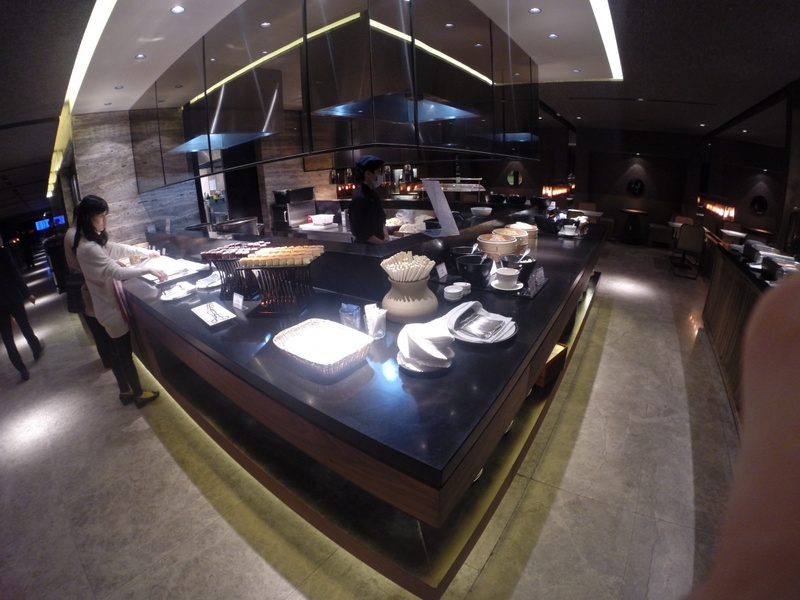 Overall, I was totally satisfied and happy with the food, service and atmosphere in the lounge. Highly recommend it! On the way out, I checked the bathrooms and the sleeping room, both of which were extraordinary. When traveling, it can be quite tiresome, yet the sleeping room was spacious, had a comfy looking lounge/bed, while the bathrooms had showers, lots of space to get dressed and were very calm and serene. Flight to Denpasar: I got on this flight refreshed and ready to get to Bali. There were only a few people on the flight, so the attendants were helping me with everything. I skipped the meal on this flight, although the food they served looked very good, instead opting for a cheeky glass of white wine. I was in the first row, which was very spacious, with a pull out TV screen, with the same movies from the last flight, plus a few more. The flight overall was comfy, event less and great service. The plane seemed new, with lots of space and totally worth the extra price. Although the seats didn’t fold out like the previous flight, the legroom was very spacious, especially being in the first row. Overall: I would highly recommend upgrading to business class if you have a long haul flight using China Airlines. It’s one of the better airlines that I have flown in business and I will definitely be paying the extra charge for it, compared with other airlines. The service was fantastic on both flights, something that is hard to come by on airlines today. While the LAX lounge wasn’t spectacular, the lounge in Taiwan definitely made up for it and is now a place that I will be happy to have a longer layover in. Definitely worth paying extra for this if it’s an option on your next route. Let me know your thoughts! Have you flown China Airlines? Do you like them? What’s your favorite lounges or airlines? We are looking at your route as well. But there are 4 of us in our family flying so I don’t think we can swing the price of business class. We are looking at premium economy which looks like a nice upgrade from economy. Did you get a chance to see those seats on your fight? Hi Eliza! I would say for younger ones, business is a tad ‘waste’ of money because they will definitely not appreciate it like we do I did try premium economy and it wasn’t bad at all. If you get a full row (center of the plane) it will be great for you, otherwise request both window/aisle in two rows. I was on the window which I didn’t like at all, and also got to be on window which was great. Hope that helps! What Am I Doing in Thailand?